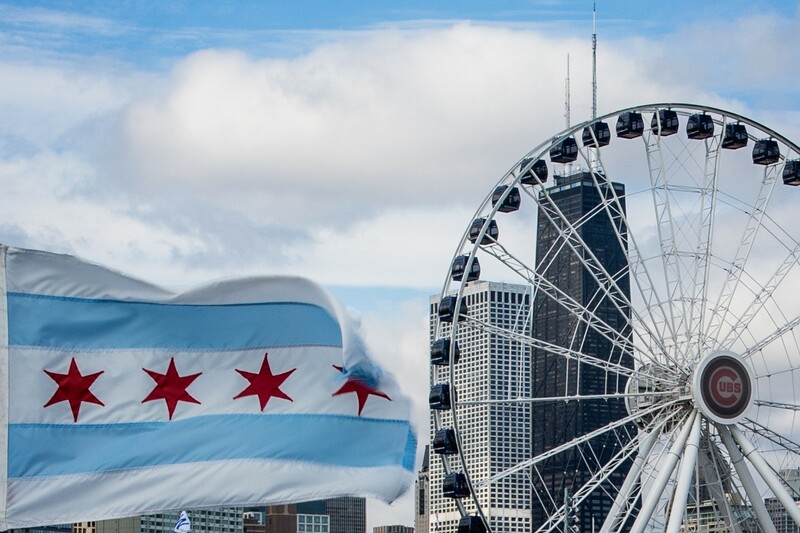 The Chicago flag, an image close to the hearts of many Chicagoans, is now 100 years old. 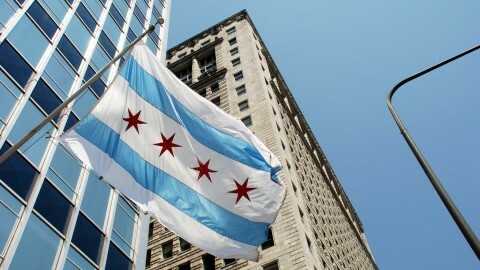 The City Council adopted it on April 4, 1917 after a design competition held by the Chicago Municipal Flag Commission. Wallace Rice, a writer and Art Institute of Chicago lecturer on flag design, was responsible for writing the rules of the competition. After the commission reviewed more than 1,000 submitted entries, Rice eventually emerged as the winner. Rice’s design is simple, yet striking, and is full of symbolism that speaks to the history of Chicago. It consists of two light blue stripes cutting across a white background to create three white stripes alternating with the blue. The middle white band, which is thicker than the top and bottom, contains four red six-pointed stars. The white and blue areas represent the city’s physical geography. The three white bands stand for the north, west and south sides of the city, while the blue stripes are symbolic of the city’s important bodies of water. The top blue band represents Lake Michigan and the north branch of the Chicago River. 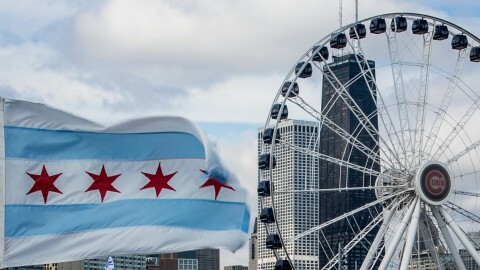 The bottom band represents the south branch of the Chicago River and the Chicago Sanitary and Ship Canal (which connects the river to a tributary of the Mississippi River system). Although today the flag has four stars, it began with just two, and people frequently present new ideas for the addition of a fifth star. 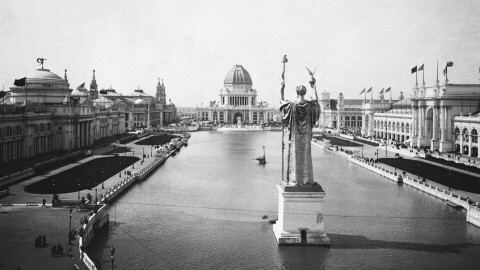 The original two stars were those for the Fire and the 1893 World’s Fair. The other two were added in the 1930s. In the original design, Rice aligned the two stars on the left to leave room for the addition of future stars to the right. Today the four stars are centered. 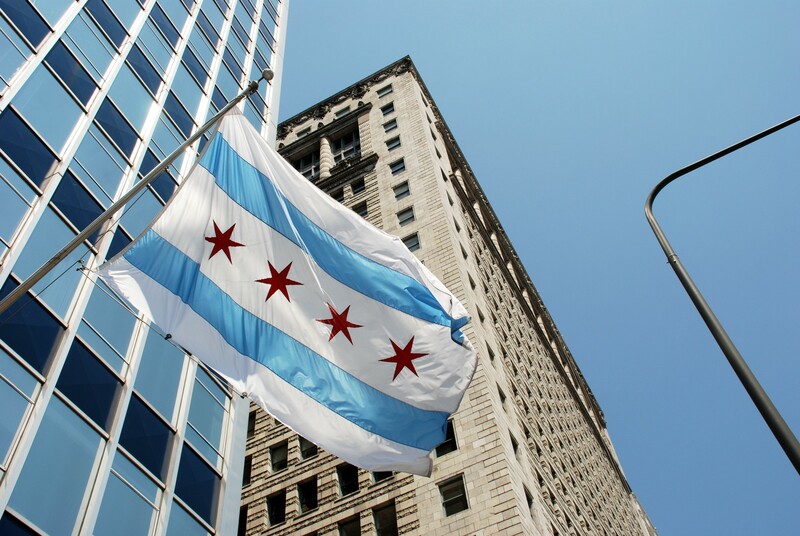 Chicago’s flag is one of the most popular and widely-recognized city flags in the country. 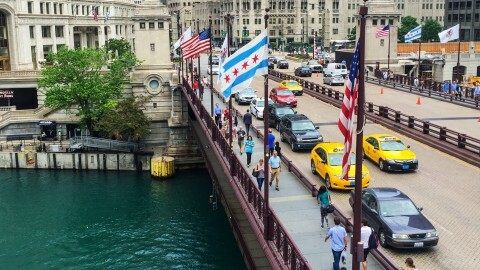 In 2004, the North American Vexillological Association conducted an opinion survey on American city flags and Chicago’s came in at number 2 of 150—second only to Washington D.C.’s flag. 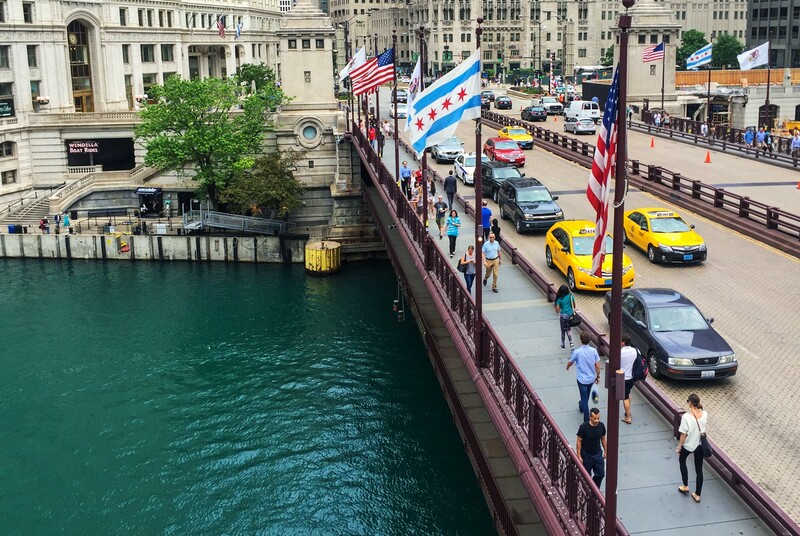 Found on buildings and public spaces throughout the city, the Chicago flag provides a visual detail that unites Chicago’s urban environment. Next time you’re out walking around, try counting how many times you spot it. 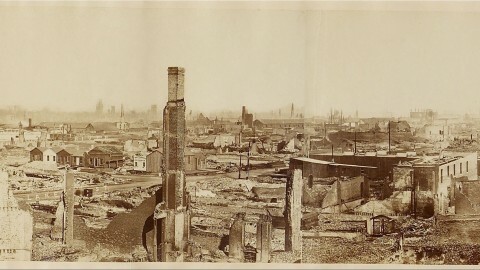 What if the Great Chicago Fire of 1871 Never Happened?